Required Education: Master's Degree in Geology /Geographics from HEC recognized University. 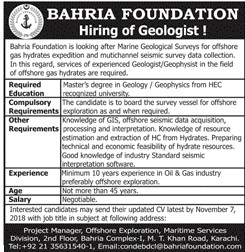 Compulsory Requirements: The Candidates is to bound the survey vessels for offshore exploration as and when required. Experience: Minimum 10 Years experience in Oil & Gas Industry preferably Offshore exploration. Interested candidates may send their Updated CV latest by November 09, 2018 with Job Title in the subject at following Undersigned Address. 2nd Floor, Bahria Complex-I, M.T Khan Road, Karachi.